It doesn't look like this is set to be the Samsung Gear Fit 2 Pro sequel we had all expected though. Both are far cheaper devices with less premium looking designs than Samsung's last fitness tracker. The company announced the new trackers alongside the Galaxy Watch Active and Galaxy S10 family. Below we'll run you through all of the details you need to know about both the Galaxy Fit and Fit E.
Previous rumors have suggested a May 21 release date in the US, but we can't confirm that yet. For the price, we know it's set to cost $99 / £89 but we don't currently have information for Australia. The Galaxy Fit E meanwhile is set to cost $35 / £35, but we don't know pricing for Australia yet. That's 282 pixels per inch, and should offer a clearer picture than a lot of other fitness trackers with black and white displays. The Galaxy Fit E's screen is a lot less impressive, with a 0.74-inch black and white PMOLED display and a resolution of 64 x 128. That's 193 pixels per inch. Both trackers come in black, while the Galaxy Fit also comes in a silver shade. The Fit E is available in both white and Canary Yellow, which should be suitable for you if you're after a bolder design. These have similar designs to other fitness bands, with thin straps and they're lightweight too. The Galaxy Fit is only 24g even with the silicone strap while the Fit E is 15g with its strap included. The Galaxy Fit is 18.3 x 44.6 x 11.2mm while the Fit E is a bit smaller in every way at 16 x 40.2 x 10.9mm. If you're looking for a lightweight and easy to wear fitness tracker, these are sure to be suitable for you. Fitness is likely the reason you're looking at this health band, and Samsung has packed it full of basic features. Both are capable of step-tracking and will automatically monitor your movements so they'll know when you've started a walk, run or bike ride. The Galaxy Fit range can also track general dynamic workouts, but they don't come with the sizable selection of automatic exercises that you'll find on the Galaxy Watch Active. Instead, you'll find 90 different types of workout within the Samsung Health app that you'll have to manually select before you start them. Samsung has also said there are both sleep analysis and smart stress management features on both trackers, but we've yet to learn exactly what they'll be able to do. Both trackers feature heart rate monitors - although we don't know what type of tech is being used here - but only the Galaxy Fit features a gyroscope. 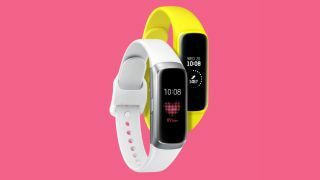 The Galaxy Fit features a heart rate tracker, but you won't get that if you opt for the Fit E. Neither of these come with GPS either, and there's no clarification on whether the Fit will include Connected GPS features. The chipset inside the Galaxy Fit is an MCU Cortex M33F 96MHz. We don't currently know what sort of power it will provide, but it's sure to power the tracker well enough to run basic services. The Galaxy Fit E has an MCU Cortex M0 96MHz. Samsung has also included a small amount of storage on the Galaxy Fit and Fit E, but this won't be for your own use so you won't be able to play music through these.